DVB-T Finder can be helpful for antenna alignment. Basing on GPS data it will show you nearest DVB-T and T-DAB transmitters. Since it can handle phone compass data – it will show you direction for any DVB-T transmitter. What this app not do? This app is not suitable for watching tv. This app should run on any android device with operating system version higher than 2.3. Although to run all app features phone should have built in GPS sensor, compass (magnetometer) sensor and screen larger than 4” and Android in version better than 5.0. In which counties this app should work? 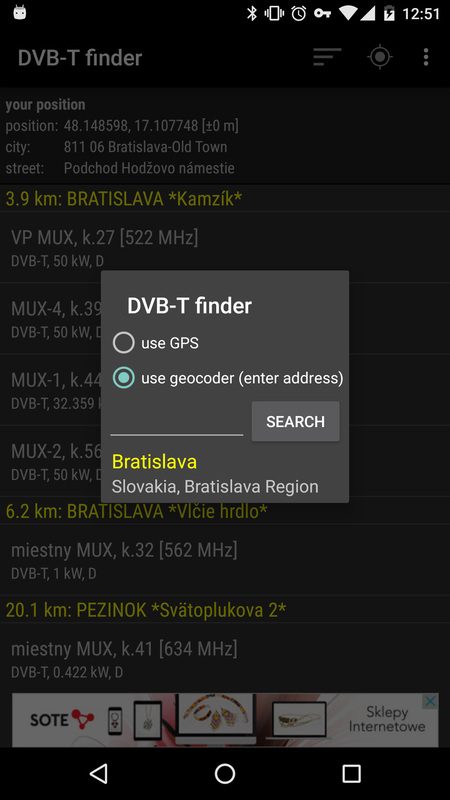 DVB-T Finder got built in database from Poland, Germany, Czech Republic and Slovakia. In this countries this app should work. In other countries this app will not work. If app will not find your GPS position you must go near the window or outside the buildings. 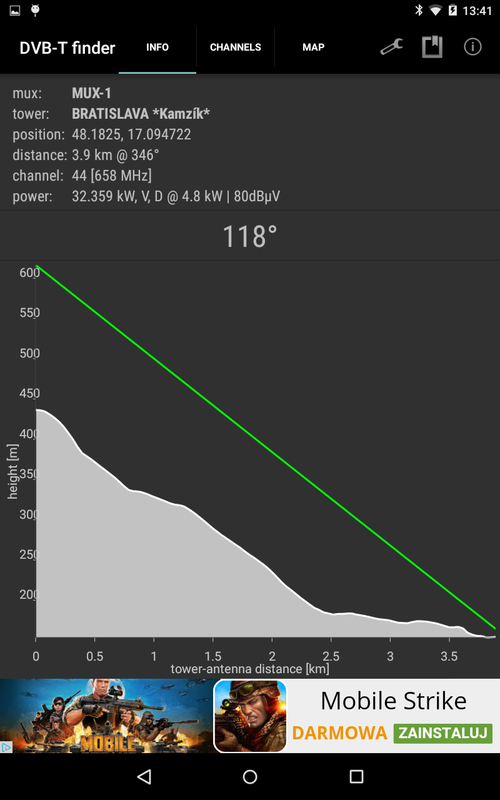 If everything will go OK – the app should give you list with nearest (standard in 100 km range) DVB-T transmitters. Before you enter the app you should turn on GPS in phone settings. If not – app will ask you to turn it on. Then the app will try to find your proper GPS position. Since GPS is not working inside buildings you should go near the windows or even outside the buildings. 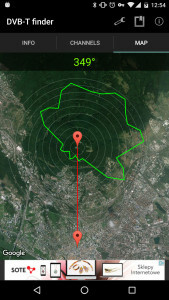 If app will find any transmitters in given range (standard – 100 km) – app will show it. If not – proper message will be shown. App after start. On top bar there are few icons. From the left side – filter options, geocoder, other options. Number of icons can vary depends on phone screen size. On smaller screens there could be one or two icons. On larger screens there could be more icons. transmission type, transmitter power, information about radiation pattern: D – directional, ND – not directional. There is possibility to filter results on the list. By default app will show transmitters in 100 km range from given place. You can change this distance, but you must remember that enlarging the distance can for example hang app or slow it down. There is also possibility to set up minimal transmitter power. It could be useful to filter secondary transmitters. User can also show or hide transmitters from each countries. For Poland there is also separate option to show/hide transmitters from payed 4th mux called Telewizja Mobilna. If you want to find transmitters for location other than your GPS location you can use geocoder. To find proper position you should enter address in format: “city, street”. If you tape interesting transmitter it details will be shown. In Distance after “@” azimuth for transmitter is shown. In Power there are from left: power, polarization, radiation pattern and calculated signal level. If transmitter is directional – also real power in given direction is shown. Under basic data there is compass indicator. If it value and azimuth are quite the same – indicator will be green. In this situation front of the phone should point to the transmitter. Below compass indicator there is terrain profile. This diagram is made in flat Earth approximation. It should work fine for small distances. For most countries transmitters got information about it height but for example for Czech Republic this information is not provided. In this case app calculate data assuming that height of the transmitter is 0 meter. On second tab there is a list of mux channels. On third there is a map. 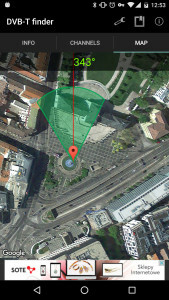 Red line is connecting given location and the transmitter. Green triangle show more or less where front of the phone is pointing. If the transitter is directional and the data about it pattern is in database – the radiation characteristic is shown. In general the size of the diagram is scaled to 70% of distance from antenna to transmitter. So the size of the pattern is not related with transmitter coverage. 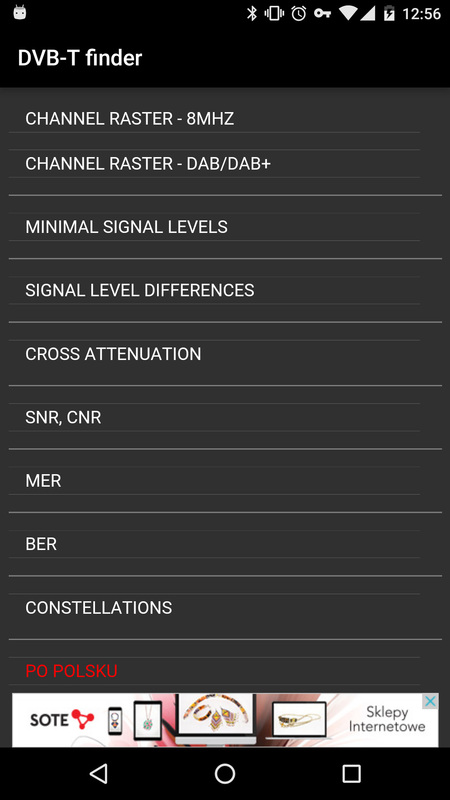 In options there is possibility to setup antenna height (proper antenna height is required to correct field strength calculations), compass low pass filter (to get compass readings more stable). The last setting is most interesting – “north on top”: by default on all maps there is north on top. 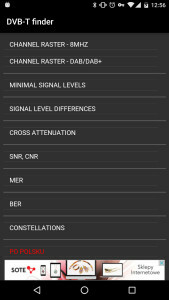 By unchecking this option on the top of the map there will be azimuth to the transmitter. In this way when compass indicator will go green – the front of the phone will show the direction to the transmitter. There is also built in reference book in which you can find channel raster, minimal signal levels and some other maybe helpful information.